Yep. There are what we'd call mirrorless cameras in all those sizes. At Small Medium Format both Fujifilm and Hasselblad have current cameras. At FX (old 35mm film size) we've got several Leica plus the Sony A7 models. At DX (also called APS) we've got the Canon, Fujifilm, and additional Sony Alpha models. At m4/3 both Olympus and Panasonic make a wide variety of models. The Nikon 1 (what they call CX) checks in at the next lower size. And at the bottom, we've got cameras like the Pentax Q and some of the Ricoh GXR modules. Both Fujifilm (GFX) and Hasselblad (X1D) are now making mirrorless camera models with the Sony 50mp "medium format" sensor (44 x 33mm). Medium format is in quotes in the previous sentence because most of us that remember medium format from the film era remember a larger capture size (56 x 44mm). I refer to the Sony 50mp sensor as "small medium format," therefore. But you might have noticed something in this section: there is variation of generations in the full frame sensors being used, and that does have the result of making data from some cameras better than from others. The Sony A7 models tend to be the leaders in mirrorless full frame offerings, with an amazing low light version (12mp A7sII), a highly competent mid-range version (24mp A7II), and the pixel king (42mp A7rII). Pretty much all of the APS-sensor mirrorless cameras equal the image quality of the APS-sensor DSLRs. Canon uses the same exact Canon-produced sensors in their mirrorless and DSLR models; Sony does the same thing with their models, using Sony sensors. Fujifilm uses a custom filtration system over a standard Sony APS sensor. I'll save you some grief: unless you have a specific need don't get too worried about whether a sensor line exceeds or lags expectations. Those expectations are that APS is one stop behind full frame, m4/3 is less than a stop behind APS, and 1” is a stop behind m4/3. Going the other way, small medium format is perhaps a stop better than full frame. The first mirrorless cameras came from the transition from 4/3 (a DSLR-type design) to m4/3 (mirrorless) by Olympus and Panasonic. The Olympus Pen E-P1 and Panasonic GF-1 and GH-1 were the first widely available and fully fleshed out mirrorless cameras. Both companies have been rapidly iterating ever since (over 40 different cameras!). The 2x crop of the m4/3 sensor is less than the same level of drop down from APS in size that APS is to full frame. It's still considered a large sensor compared to what's likely in your compact camera or cell phone. The thing that makes the m4/3 size so interesting is that it's small enough so that the smaller imaging circle required of lenses makes for...you guessed it...smaller lenses. The drop in size of lenses from full frame (FX) to APS (DX) isn't terribly dramatic, nor is the drop from an APS (DX) lens to m4/3 lens. But the difference between my Nikon FX kit with a full range of lenses that cover 14mm to 400mm to my m4/3 kit with lenses covering the same angle of view is much more dramatic. My biggest complaint about m4/3 used to be that Olympus was still using sensors that weren't really state of the art when it was launched. That changed with the E-PM2, E-PL5, and OM-D E-M5 introductions, which had very state of the art sensors. Panasonic also moved on to newer sensors that moved the bar forward. Recently, both Olympus and Panasonic have gone from 16mp to 20mp in most of their models, and are using basically the same technologies as in the APS sensors. Thus, there's less than a stop difference between APS/DX cameras and m4/3 cameras, all else equal, and often times you can find m4/3 lenses that will pick that back up that aren't available for APS/DX models. 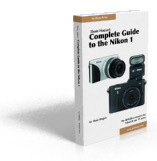 One more step down in size—again about the same near one stop step as between the other sensor sizes—comes the Nikon 1. While the smaller sensor size could have produced an even smaller body and lenses, in practice, many of the Nikon products in this format have been near the smallest m4/3 camera size overall. The good news is that the Nikon 1 sensors have been state-of-the-art in efficiency, so they tended to play above their league. Nikon has once again shown that they know how to make very efficient sensors. One thing to consider, though: the 1” sensor in the Nikon 1 models is now the same as the 1” sensor in many Canon, Nikon, Panasonic, and Sony compact cameras. Moreover, many of those fixed-lens models have better lenses than you get with the Nikon 1 kits. Personally, I wouldn't invest in Nikon 1 (CX) at this time because of that. If we step down yet again—slightly more than the steps we took in the other sensors we looked at, above—we get to sensors that are the size used in many compact cameras, especially older ones. Right now, the Pentax Q and some of the no-longer made Ricoh GXR modules use sensors in these small sizes. The problem with small sensor size is that you're fighting a floor: there's a randomness to photons in the world. As you collect less and less of them, their randomness shows up as shot noise. These small sensors tend to be near enough that floor that shot noise is indeed a factor that needs to be always considered, even in brighter light. We've now completely lost the Nikon 1 shooter and we're starting to lose the m4/3 and APS shooters, as they don't really any reasonable lens choices to come close. Hmm, the Nikkor 50mm lens only goes to f/16, so we're starting to lose the FX shooter.